Running a household can be a very long, complex and tedious business. That is why software engineers have designed so many programs to help people keep track of the most important items that they keep and use at home. One such program, to which this article is dedicated exclusively, is the Home Inventory Spreadsheet, and we shall teach you how to use it to your best advantage. You can get the home inventory spreadsheet absolutely free right here on this page. 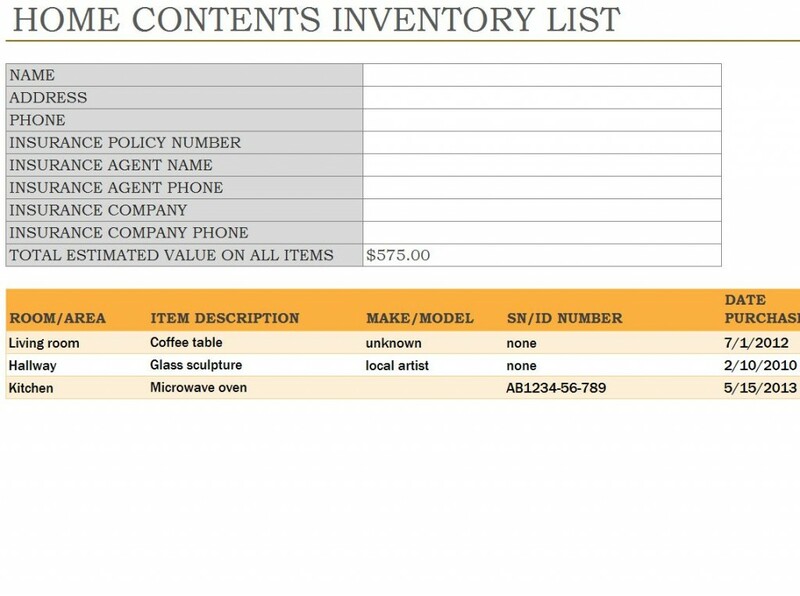 The Home Inventory Spreadsheet is a Microsoft Excel template in which you can store information regarding each of your household assets. In the upper left-hand corner you enter your home address, and in the upper right corner you put in your all-important insurance information: the insurance company, the name of your agent, his or her phone number, the policy ID number and the estimated value of the policy. Whenever you buy a new TV, computer, sofa, stove, bed or other major item, enter it, along with all the relevant information, into your spreadsheet file. You will find Home Inventory Spreadsheet to be such an invaluable thing to have that you’ll wonder how you ever managed without it.